A last second drop-goal from Ben Roberts clinched an incredible 25-24 win for Castleford Tigers against Super League leaders St Helens at a rocking Mend-A-Hose Jungle. The Tigers came back from 18-10 down at half-time to end their 15-game losing run against Saints in thrilling style and make it two weeks running that they had defeated the top of the table. In a fantastic finish that saw incidents all over the place Cas were still trailing with four minutes to play before Luke Gale kicked a penalty to level it at 24-24. Gale then sent a long range drop-goal wide and Luke Walsh fell short with a drop-goal attempt at the other end. Roberts dropped the ball running it back out, but incredibly from the resulting scrum 20 metres from the home line James Roby knocked on. Cas had less then two minutes to come up with a winning score and a long way to go yet drove into their opponents half with Andy Lynch and Jake Webster making strong drives and Roberts took charge to land a memorable drop-goal..
Castleford had made another of their strong starts in the opening half as they exerted strong early pressure off the back of a couple of penalties and after Andy Lynch came within inches of a try Justin Carney did open the scoring. The Australian winger marked his return from a dislocated elbow as he took only five minutes to score in typical fashion, brushing off three defenders to bulldoze his way over in the corner off Ben Roberts’ pass. But Carney went from hero to zero within seconds as he dropped a clever Saints restart to give the visitors good field position. Jon Wilkin and Louie McCarthy-Scarsbrook were both held up over the line then Luke Walsh made no mistake, racing onto Travis Burns’ grubber kick to score a try eight minutes into his own comeback from injury. Carney went close to another try for the Tigers when he got hands to Luke Gale’s high kick over the line only to knock-on to St Helens’ relief. The visitors made the most of their let-off when Alex Walmsley found an alarming hole in the Cas defence near the line to score his side’s second try, again goaled by Mark Percival. Saints looked set to score again when McCarthy-Scarsbrook was held up over the line again and Adam swift dropped the ball with the line begging. At the other end, Roberts also dropped the ball with Carney unmarked to his outside and a try looking on. The next mistake proved costly as St Helens lost the ball near the home line and quick as a flash Denny Solomona was on to it to race past the cover and cut inside superbly past the last man for a spectacular try goaled by Gale. But Carney lost the ball in the first play after the restart with James Roby looking to have got away with a steal and from the next set the visitors scored again with Joe Greenwood taking advantage of soft defence to charge over. Percival converted to make it 18-10 at half-time. Daryl Powell’s interval team talk seemed to have his side pumped up for the start of the second period and within six minutes they had cut their deficit to two points as a superb set ended with Webster diving onto a well judged kick over the line by Roberts. With Gale goaling it was 18-16. Oliver Holmes threatened another try with a strong break and Adam Milner was held up over the line. It was all Cas now and they went in front as Matt Cook marked his return from injury with a try, picking up and touching down over the line after Gale’s high kick had bounced off Jordan Turner. However, five minutes later Saints went back in front with a controversial try. Replays seemed to show Shannon McDonnell was offside as he chased a Turner kick and touched down over the line, but after referee Richard Silverwood signalled a try he was allowed it, much to the anger of home fans as their side had fallen victim to this year’s new video referee system. A long delay followed after Swift suffered a head injury and had to be carried off, bt the action soon picked up again and St Helens went down to 12 men when Percival was sin-binned for holding down in the tackle after Solomona had made a swift break. 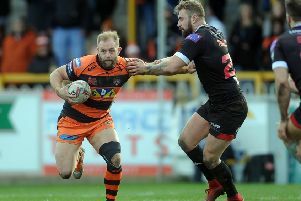 The thrilling finale ensued and all the earlier controversy was forgotten as Castleford came through in the end for their fourth successive win. Scorers - Castleford: Tries Carney, Solomona, Webster, Cook; goals Gale 4, drop-goal Roberts. St Helens: Tries Walsh, Walmsley, Greenwood. McDonnell; goals Percival 4. Castleford Tigers: Roberts; Solomona, Webster, Shenton, Carney; Finn, Gale; Lynch, Moore, Millington, O Holmes, McMeeken, Massey. Subs: Milner, Moors, Cook, Bailey. St Helens: McDonnell; Dawson, Percival, Turner, Swift; Burns, Walsh; Amor, Roby, Walmsley, McCarthy-Scarsbrook, Wilkin, Jones. Subs: Masoe, Richards, Flanagan, Greenwood.